The reigning American League Cy Young Award winner faces the runner-up when the Tampa Bay Rays host the Houston Astros on Opening Day Thursday at 4 p.m. ET. Rays lefthander Blake Snell (21-5, 1.89 ERA in 2018) begins the defense of his Cy Young Award against the Astros' ace Verlander (16-9, 2.52), who finished second in last year's voting. Both pitchers were rewarded with contract extensions this spring, with Snell signing a five-year, $50 million extension through 2023 and Verlander inking a two-year deal that will reportedly pay him $66 million over the 2020-21 campaigns. Verlander will be making his 11th Opening Day start when he leads the defending AL West champions into the 2019 season. The veteran Astros weren't able to defend their 2017 title, losing to the Boston Red Sox in the ALCS last season, but again appear ready to contend for a trip to the World Series. The primary drama in Spring Training for Houston was who would assume the role of fifth starter due to Josh Johnson's quad injury and Brad Peacock beating out Framber Valdez, who will begin the season in the bullpen. "Position player-wise, it played out exactly how we expected," manager A.J. Hinch told the Houston Chronicle. "Pitching-wise, maybe Framber in the bullpen is a little bit of a surprise. It wasn't something we set out as a goal if he didn't win the rotation, but he's got great stuff and we need to utilize that in the big leagues." On the injury front, starting right fielder Josh Reddick was scratched from Sunday's Grapefruit finale because of back stiffness, but said he'll be ready for the opener. "I've had this back issue several times in my career, and it just kind of 1/8came 3/8 up and we didn't want to risk anything," he told MLB.com. "I got some treatment on it all morning and didn't want to go out there and make it worse." While the New York Yankees and Red Sox battled for the AL East crown a year ago, the young Rays used a 19-9 September surge to finish 90-72, 10 games behind New York and Boston. "We're not going to walk up on someone anymore," outfielder Tommy Pham told MLB.com. "Teams know us. They know that we're young, and they know that we're good. We're going to have to bring it, because they're coming for us now." In addition to the talent already in the majors, the Rays' farm system ranks second in baseball according to Baseball America, and it has nine top-100 prospects. Manager Kevin Cash is expected to use a three-man starting rotation of Snell, Tyler Glasnow and former Astro Charlie Morton followed by "openers" and bullpen games backed by a strong relieving corps. Meanwhile the Rays will be without third baseman Matt Duffy for at least the first seven games because of a hamstring injury. Yandy Diaz, Daniel Robertson and Joey Wendle will see most of the time at third base in Duffy's absence. 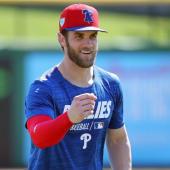 "We're going to probably take our time, and he'll probably go to some non-baseball activities for about two weeks," Cash told MLB.com regarding Duffy. "Then see how he's feeling after that."